As a woman, who at my current stage of life has no children or a mortgage and is somewhat ‘carefree’ with her finances, I thought the recent noise in the marketplace around superannuation was not relevant to me. I was wrong, dead wrong! To the point where I emailed my mother, my sister, my girlfriends and insisted they read some of the recent statistics surrounding superannuation and women in Australia. As a demographic, we are already hindered by an on average lower income than our male counterparts and extra family responsibilities. We as women need to get serious about our super. For many women in their 30s and 40s, life is about striving to find a balance between work and family and the thought of planning for the future and retirement seems to waiver on the list of urgencies. Reported in the Sydney Morning Herald (SMH), a survey conducted last year by the Association of Superannuation Funds of Australia (ASFA) and Suncorp found women were more likely than men to feel “inadequate, ashamed or dumb” when it came to their superannuation. Additionally 41 per cent of women surveyed said they felt “powerless”. This is where we need to group together and discuss financial issues in a simplified and ‘female-friendly’ forum. Emily Carter is a busy mother of two who says, “women need to think about their financial future, I know I am”. Working mother, Emily Carter, 31, has a 1 year old son, Harrison and a 2½ year old daughter, Annabelle and works three days a week as a Human Resources Manager in Brisbane’s CBD. She also teaches four group fitness classes a week, so it’s fair to say she’s a busy woman. “Women aren’t thinking of the future – only the here and now, so I decided to do something about it,” Mrs Carter said. “At the start of the year when I returned to part-time work I started to put extra money into my super account every week because I didn’t want to be at a disadvantage when I’m due to retire,” she said. Emily became a member of YourShare in 2010 and registered her superannuation, home loan and car insurance. “Last November I received an annual Cash-back of $1,180, it was such a huge help as Christmas was just around the corner,” she said. According to SMH, although one or two years off work may not appear to be significant, the damage is, as it can add up to thousands of dollars in lost super and earnings from compound interest. Research conducted by ASFA, says a 32-year old woman on $65,000 a year will miss out on $28,000 if she takes two years off work. This is more than the amount of the annual single pension amount at only $21,018.40. Pre-conceived notions exist, as women believe when they retire they will have various resources to fund them. These include their partner’s superannuation, the family home and investments. However, as divorce rates continue to increase it’s important women understand – a man is not the plan. Chair of Super Industry Network and advocacy group Women in Super, Cate Woods, believes young women should contribute more to their super before they leave the workforce to have children and to consolidate their accounts. “The best way is to save up through salary sacrifice with the maximum that you can,” she said. So what does the future hold for women? It’s unlikely our situation is likely to change. We will probably remain the main child raisers who stay home and take the time off work to care for ageing parents and young children. 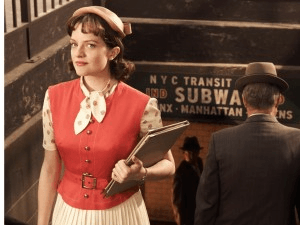 Peggy from TV show, Mad Men is single and savvy – why not take a page from her feminist rulebook. Although, a fictional character, Peggy Olsen from Mad Men stood up to Don Draper and the scotch swilling, male advertising executives who dominate the show and fought her way to equal rights in the workforce (well somewhat equal rights). However, in real life the wage gap may not change in our lifetime, so we need to get serious. Start making small changes now, like implementing salary sacrificing in your household and putting a small portion of your weekly wage into your super account. Additionally, register your financial products with YourShare and put your Cash-back straight back in to your superannuation account. So ladies, what are you waiting for? Calculate your Cash-back on your superannuation now.